I have many happy memories of eating at Bella Italia, but over the years they’ve fallen off my radar a bit. There are so many Italian restaurant chains in the UK now, but I was really happy to try out the new Bella Italia in Walsall last weekend. Disclosure: I was invited to take my family to Bella Italia in Walsall. They were aware that I was visiting and our meal was fully paid for, but the opinions in this post are all unbiased. Whenever we go out for a meal, Italian food is always really popular. We all enjoy pizza and pasta, and so it’s usually a safe choice when I’m booking a restaurant. But there are almost too many Italian restaurants to choose from these days, and we haven’t been to a Bella Italia restaurant for several years. Actually, I remember the last time we went was when we were going to see John Barrowman in a pantomime at the Birmingham Hippodrome. That must have been about 7 or 8 years ago, and from what I remember the food and service were good but the restaurant itself was looking a little bit tired. So when I was asked if I’d like to review the brand new Bella Italia at the Waterfront complex in Walsall, I got a definite ‘Yes’ from the whole family. We were all keen to see what the restaurant would look like as the pre-opening press coverage said it would be designed in Bella Italia’s “new trademark colourful, fun, Italian image”. The Waterfront complex itself has several restaurants to choose from, and is in the middle of a very new development area in Walsall, just a few minutes off Junction 10 of the M6. We had booked for 3pm, and the restaurant was still pretty busy when we arrived. We were quickly shown to our table by a very friendly waitress who ran through the soup of the day and a couple of items which were unavailable. She also told us one of her favourite menu choices, which I thought was a nice touch. Looking through the menu, it was clear that there were plenty of yummy options for us all to choose from. Lyle and I are both pretty adventurous eaters, while Ollie can be a bit more cautious though he’s getting a bit braver these days. Mark was going to be the hardest one to please, as he is doing the Insanity workout. He was pleased to see that the menu has a range of main courses which are under 600 calories, and starters which come in under 300 calories. He only noticed the selection of dishes using spiralised vegetable ‘spaghetti’ after we had ordered. I think that would have been a good option for him and it’s definitely something I’d like to try in the future. We also asked for a bottle of Pinot Grigio, but it was unavailable so we were offered a bottle of the Gavi instead. It was fairly crisp and dry, and a good replacement. Our starters arrived, and they all looked good. Mark had gone for whitebait, Ollie had chosen calamari and Lyle had picked the garlic king prawns. 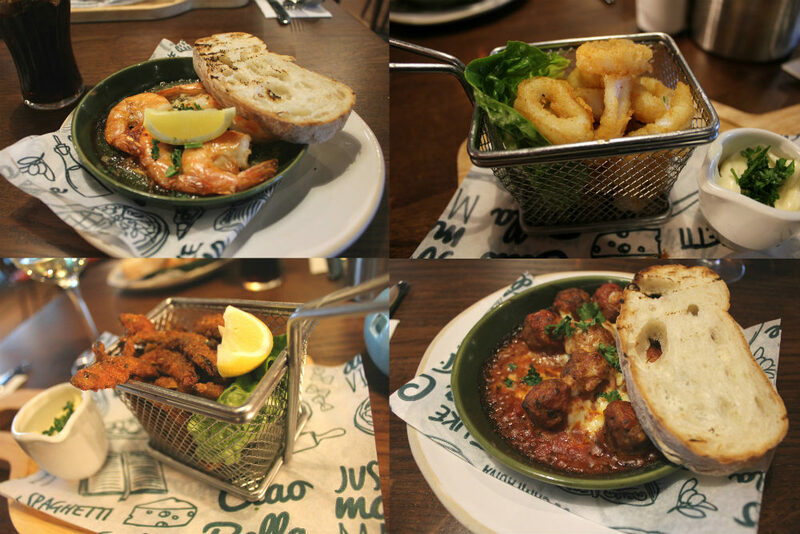 I was the only one who hadn’t gone for a fish/seafood starter – I’d chosen the Polpette, little beef and pork meatballs in a spicy tomato sauce with a slice of griddled ciabatta. The meatballs were light and tasty, and I really enjoyed the bread dipped in the tomato sauce. I tried a piece of Ollie’s calamari and was pleased to see that it wasn’t overcooked. Mark enjoyed his whitebait, it was the first time he’d had them. While I still can’t get my head around eating a whole fish, I did like the flavour of the one that I sampled – slightly spicy with a garlic and lemon mayonnaise. As for Lyle’s garlic prawns, he attacked them with gusto and declared them delicious! There was a short delay before our main courses turned up, which our waitress apologised for. It gave us time to have a good look around the restaurant. The decor is definitely bright and modern, and more colourful than some of the other Italian restaurants we’ve been in. We all really liked it, and I especially liked the posters which were displayed on the walls. 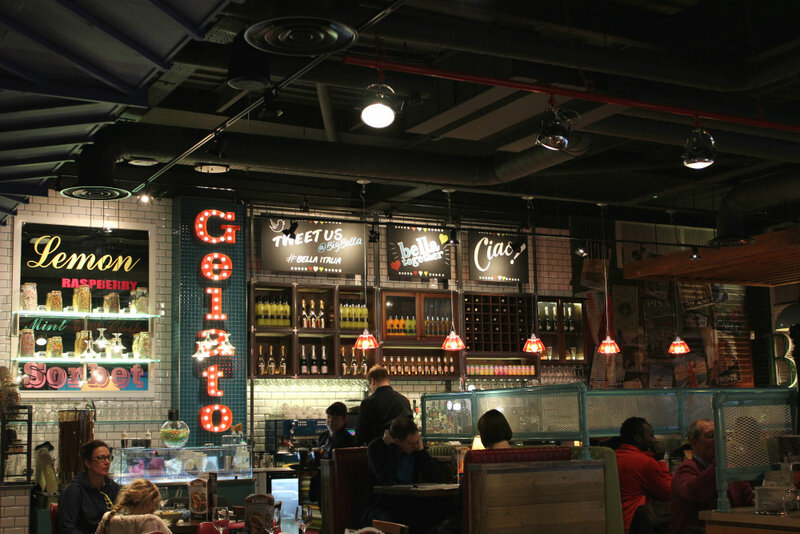 There is an open kitchen, and a brightly lit gelato stand which looked pretty tempting. When our main courses arrived, there were plenty of Ooohs and Ahhhs around the table. The boys had both gone for pizza, with the plan that they would swap a slice so that they could try both of them. Ollie’s went for the Carne Mista pizza topped with Italian cured meats, while Lyle had picked our waitress’s suggestion of the Chicken and Pancetta BBQ pizza. It didn’t look pretty, but he said it tasted really good and was one of the best pizza bases he’d had in this country. Mark had tried to stick to his nutrition plan by picking a grilled chicken breast and salad, but then ordered a side of chips as well! His salad could have done with a little dressing, and the mushrooms were a bit over-done, but the chicken was good. My choice was a bowl of Spaghetti Gamberoni – the spicy tomato sauce was packed full of flavour, and the prawns which were cooked really well. It’s easy for prawns to be overcooked, but these were sweet and juicy. The only bad thing about my meal was that the portion size was huge – there was far too much pasta for me and I felt a bit bad about leaving so much of it. Both pizzas were demolished, Mark tried and failed to resist the chips, and I ate as much as I could of my pasta. But we all made sure to leave room for pudding… Ollie and Lyle both went for the gelato option, and I ordered my usual tiramisu. I always pick tiramisu the first time I visit an Italian restaurant because it’s a staple Italian pudding that should be done well. Mark first said he wasn’t going to have pudding, but eventually was convinced to order the vanilla cheesecake. The boys enjoyed their sundaes, and although Mark was only going to eat part of his pudding without the pouring cream, he eventually polished off the lot! I really enjoyed my tiramisu, it was very light and creamy although there wasn’t too much taste of Marsala in it. It’s a matter of personal taste, but to my mind a Tiramisu can’t ‘lift me up’ if it hasn’t got a kick of Marsala! Still, it was good and I managed to finish it all. We all agreed that we’d enjoyed our meal immensely. The food was good, the service had been friendly and the restaurant had a nice lively atmosphere for a Sunday afternoon. 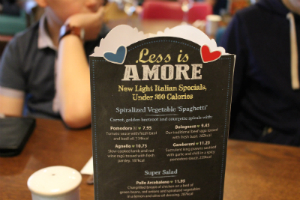 The menu had a great variety of options as well as the standard choices you expect in an Italian restaurant, and I love the spiralized veggie idea as well as the lighter options on the menu. The new look is bright and cheerful, much more modern and nothing like the tired restaurants that I remember from 10 years ago. It still bothers me a little when the waitresses say ‘Buon Appetito’ when they bring your food to the table. I know it’s a Bella Italia thing that happens in all of their restaurants, but it’s a personal niggle. Mark and I both thought that we’d have been happy to pay the prices on the menu and we’d definitely consider visiting a Bella Italia restaurant again soon. Bella Italia is one of those places that I don’t go to often, but when I do the food is always nice. Those desserts look absolutely delicious! The tiramisu was amazing, and they do some little shot glass puddings which looked fantastic as well. I haven’t visited this chain in a long time, my husband isn’t a big pizza or pasta person much to my disgust, but I am slowly getting there with him. The food looks lovely, and how lucky were you to be offered a review. Do you know I don’t think I’ve ever been to Bella Italia but the food looks tasty. I would certainly try the Spaghetti Gamberoni, it looks delish! Think I may have to try the one in Cardiff now. We have a Bella Italia near where we live and I’ve been meaning to go try it. This post has made me want to go book a table! Payday treat at the end of the week perhaps! I love Bella Italia so much! They send you weekly deals too. Oh, that’s good to know – we have another branch near us so I may be paying that a visit over half term! I don’t like it when they say it either, it just seems so fake! We had a lovely meal, very relaxed and good food as well – you can’t ask for much more than that! 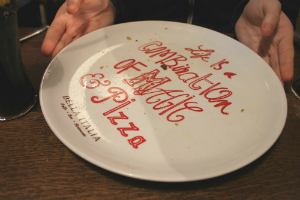 We are huge fans of Bella Italia – one of the best family friendly restaurants around. great write up and I’m now really fancying whitebait! I really like Bella, they do some really tasty meals. We also went to the Walsall one and found it a lovely atmosphere with lots of space. To be honest, I didn’t think that Bella Italia still existed. I have happy memories of eating there when I was younger too. I will have to see if there is one near me now.